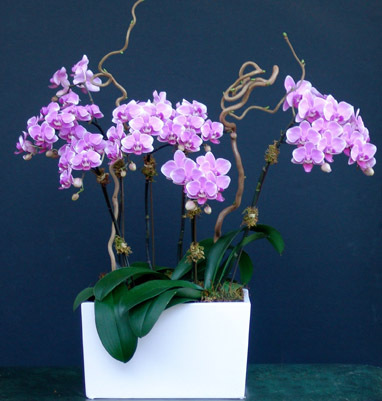 Designer Irene Cherchuck’s arrangements enhance our orchids with distinctive containers and botanical accents. She combines her professional training as a landscape architect with a flair for Chinese brush painting and interior design to produce one-of-a-kind floral motifs — for those settings and occasions that merit an extra measure of elegance. Irene is available for independent commissions, and for consultation on plant selection/placement, garden/patio design and indoor/outdoor environments. You can contact her at: floradise.irene@gmail.com.